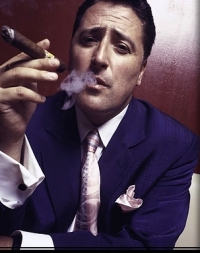 Ray Gelato is a maestro of swing and jazz, an entertainer and saxophone player of the first degree. With his powerful 7 piece band he has toured the UK and Europe performing at all the major festivals. In 2004 he performed to an audience of 40,000 at the BBC Proms in the Park, Hyde Park. Paul McCartney, Bryan Adams and Richard Branson have all requested Ray to perform at their private parties and recent TV appearances have included the hit BBC 1 show ‘Strictly Dance Fever’ where he performed “It Don’t Mean a Thing if it Ain’t Got That Swing’. Backed by a 35 piece orchestra Ray performed at the BBC’s VE Day Concert in Trafalgar Square in May. In 2005 Ray was nominated for the BBC Radio 2 Jazz Artist of the Year.